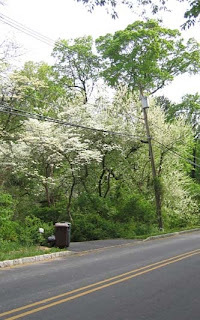 On the way to Littlebrook Elementary, a scene that looks like a cluster of dogwood trees. But the one furthest to the right has a different shade of white, and turns out to be something unusual. 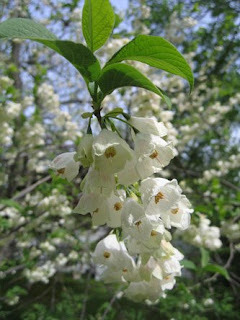 A rare native, genus Halesia, probably a very large specimen of Carolina Silverbells, also called the Snowdrop Tree. I've never seen one of these in the wild, as is typical of many of the native ornamental trees and shrubs available commercially. Fothergilla, bottlebrush buckeye, oak-leaved hydrangia--all beautiful natives, but who knows where they actually grow in the wild. 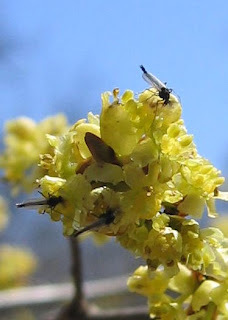 That they don't grow naturally around here raises the question as to what ecological connection they make with local wildlife such as pollinators. The insects most adapted to eat their leaves or negotiate their flower shape may not actually live around here. A couple kinds of bees were found taking an interest. 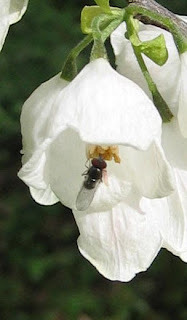 As often seems to be the case, for every insect actually visiting a flower, there are many others buzzing overhead, darting this way and that, staying close to the flowers but never seeming to land. Maybe they're very picky, or maybe some are actually predatory, interested not in the flowers but the pollinators that the flowers attract. 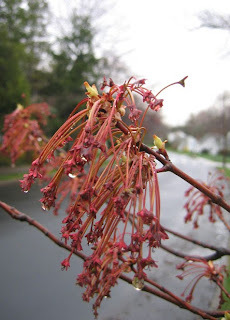 In this way, a tree in flower can seem in some ways similar to a coral reef--a substrate that attracts many kinds of life with varying agendas. 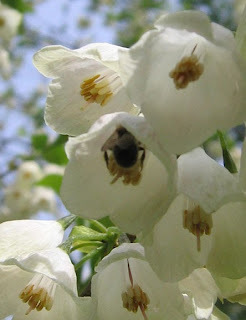 In what seems like an unlikely coincidence, a small tree closely related to Carolina Silverbells, called American Snowbell (Styrax americanus) grows in the neighbor's yard across the street. These are the only two specimens of trees in the Styracaceae family I've seen growing in Princeton. 1000 native wildflowers and shrubs in our greenhouse need to get in the ground toot sweet. This weekend, I'll be leading two planting sessions--Saturday at 10am, Sunday at 2pm. Please come and help out if you can. The planting is part of a grant, in which we are given credit, and therefore some funding, according to how many native plants we get in the ground. There will be various activities--digging, planting, mulching--and a stream close by for exploring, so kids are welcome. Bring gloves, shovels, trowels. We'll meet at Mountain Lakes House (at the end of the long driveway at 57 Mountain Ave, just past the parking lot for Pettoranello Gardens). Most people know about the big victory won at the Princeton Battlefield in 1777. Few have heard, however, of the small victory of 2009 that took place at Herrontown Woods, on the other side of town, on a sunny afternoon this past Thursday. 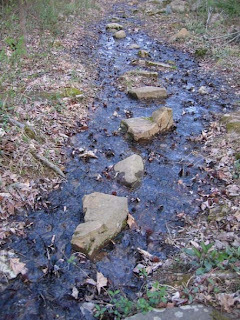 There, the mighty resistance of an eight year old to taking a walk in the woods was overcome by an irresistible alliance of rocks and water. Strident complaint dissolved into "Daddy, look at this! 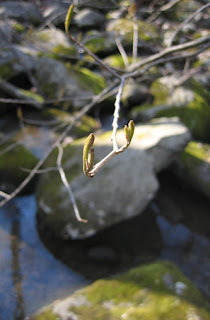 ", as we headed upstream towards a picnic in a boulder field. Contributing to the rout of homebound entertainment media was a frog presiding over a reflected forest. Plenty of auxiliary forces were on hand, effective mostly with the accompanying adult. The opening buds of a witch hazel. Some interesting stuff on the forest floor--here, a reddish-brown spiny fruit of the sweetgum, a flowering wood anemone, and some leaves of trout lily. 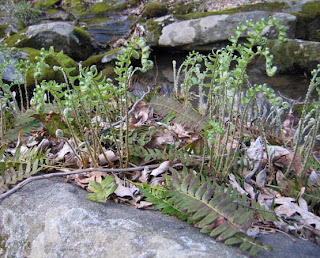 And the fiddle heads of Christmas fern perched on boulders. Even the trails were strategically rock-strewn to add sport and comfort to the way home. Well, I'm at it again, cataloging all the enigmatic creatures that take an interest in various kinds of plants. 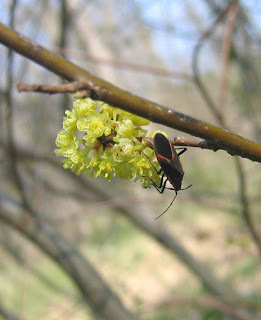 Today--or actually several days ago, while the spicebush at Mountain Lakes were still in bloom--we feature the creatures who hover, alight and crawl upon Lindera benzoin, the native spicebush, relative of sassafras. 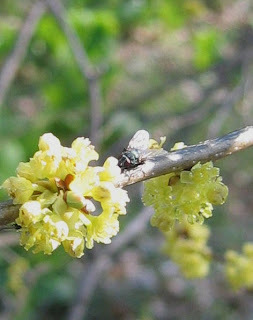 Spicebush, which blooms yellow and early, was drawing more pollinator interest than the exotic forsythia in my backyard, which blooms at the same time. The tiny insect in this photo was very numerous, and took a very serious interest in whatever the flowers had to provide. 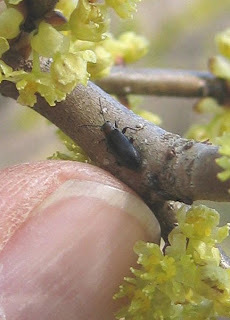 The larger, beetle-like creature is probably the same as in the preceding photo. This fly was very skittish. There were quite a few of this sort zooming around the bush, occasionally alighting briefly. It was mostly a blur, but when it stayed still for a second I could see it had a distinctive light-colored spot on the abdomen. I wish I were as organized as a red maple tree. 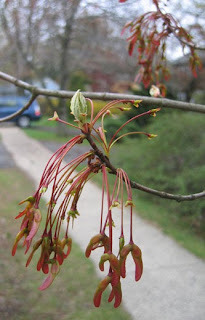 While other trees are still waking up from their winter hunch, these maples have already flowered, formed seeds and have moved on to sprouting leaves. With the task of making progeny done for the most part, the rest of the year is gravy. Louise Senior calls these volunteer days "Into the Woods", which is where we all headed this past Sunday. Louise organized some volunteers from the Unitarian Church on Cherry Hill Road to start restoring the township-owned woods that borders the church. My job with Friends of Princeton Open Space is to assist such initiatives with some supervision and supplies. Together, we cleared invasive shrubs and vines, finding amongst their dense growth some natives to save, including blackhaw Viburnum and American Holly. In the photo, Dunbar Birnie pulls an old multiflora rose away from a forest clearing. The brush was piled back in the woods to make wildlife habitat. I usually forget to take before and after shots, but here is the forest clearing choked with invasive multiflora rose bushes. This area was targeted for restoration because it is often wet, and open enough to get some sun to the ground. Here is the transformation--a wet, sunny location ideal for all the various native wildflowers that thrive in such habitat. Some more invasives removal, a follow-up planting of native plants, and what has been a rather empty woods of evergreen trees will start offering a more varied diet for the local wildlife. Thanks goes to Bill, David and Cathy Bauer-Koggen, Dunbar and Nick Birnie, Stan DeReull and Annette Sheldon. Volunteers also potted “live stakes” of native elderberry, silky dogwood and buttonbush. Cuttings from these three species can be stuck in soil and, if kept watered and given some sun, will sprout roots and leaves and grow into full-sized shrubs. This small collection of pots actually holds 60 new plants. The church is planning to have a followup workday May 17. 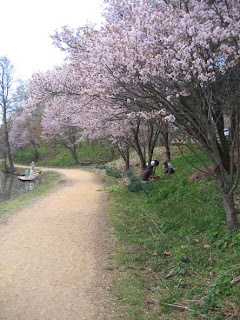 Cherry trees, planted back when the canal area was a cultivated entryway into Princeton University, add ornament to the towpath next to Turning Basin Park. Last year, the university student group Water Watch cleared out the invasive Tree of Heavens that were starting to shade out the cherries. Neither the cherries nor the Tree of Heaven are native, but the former is ornamental and non-invasive. This spring, led by Laura Burke, some fifty students took to the water in canoes and cleaned the canal of water-borne litter. A few of us stayed on land, clearing garlic mustard from the slope. 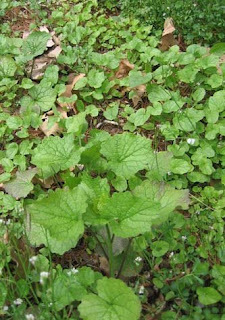 Because garlic mustard is a biennial, there were actually two generations of the plant present. We pulled only the second year plants, which were just starting to send up their flowering stalks. The smaller ones are first year plants, which we left because they won't flower this year. Many of them will die anyway, from overcrowding, before they reach the flowering stage next year. If no plants are allowed to make new seed, eventually the seedbank is exhausted and the embankment will be clear of the weed. This is called "picking your spots", because the task of removing garlic mustard from all of Princeton would be overwhelming. It's also a way to learn new things through the conversations we have, in this case about backpacking the Camino de Santiago in Spain, and the challenges of prescribed burning in the Everglades. I would love to report that shad are running in my minipond, which I dug where a small tributary of Harry's Brook once flowed, before my backyard was a backyard. 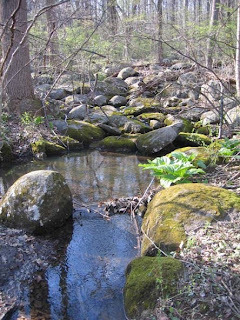 The brook is connected to the Millstone River, which flows into the Raritan River, which empties into the ocean just south of Staten Island. 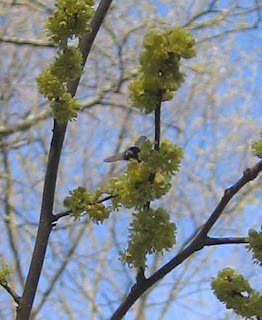 Who knows if shad ever made it up to my neighborhood, but the blooms of a solitary shadbush in the backyard tell me that somewhere the shad are running. 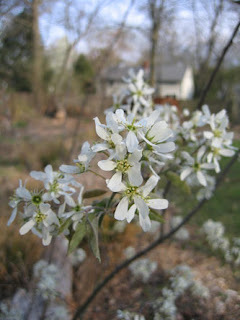 The shrub is also called serviceberry, and will have delicious berries later in the season. 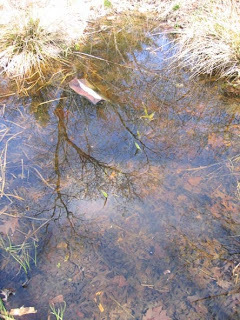 Migrating fish have lost my ecological address, but a lot of other wildlife have found it. Though the shad didn't make the walk up to my miniponds, I was surprised and flattered by a visit from a couple young wood ducks the other day. That was a first. There was also a return visit from another wild creature who did make the walk, and whose presence doesn't so much flatter as cause the heart to flutter. 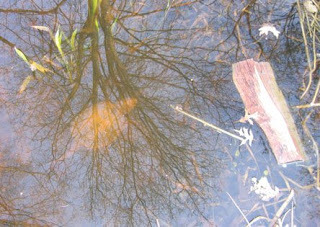 Just beneath the reflection of trees on the water's surface, a reptilian presence soaked up some afternoon rays. 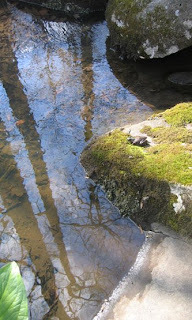 A snapping turtle, some 14 inches long, though who's going to try to measure. I thought he had left last year, but is back, bigger than before. We may take him for a short ride back down to the creek. 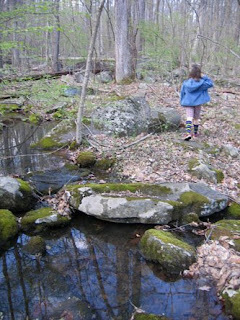 Sunday, April 26: The Friends of Princeton Open Space (FOPOS) will be holding its annual meeting at 3pm at Mountain Lakes House, 57 Mountain Ave in Princeton. After a very brief bit of business, the featured speaker, Michele S. Byers, will speak on "Garden State Greenways". Michele is Executive Director of the NJ Conservation Foundation, and writes environmental columns that appear locally in the Princeton Packet and Trenton Times. I hear she is an excellent speaker, and from the title it sounds like she will give a good sense of how all of our work with FOPOS fits into the effort to preserve functioning ecological corridors in New Jersey. Ms. Byers' talk will be followed by refreshments, after which I will lead a nature walk through Tusculum and Mountain Lakes. FOPOS is celebrating its 40th anniversary this year! 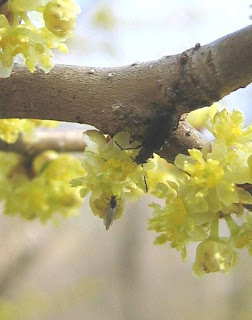 What's the Buzz on Spicebush? 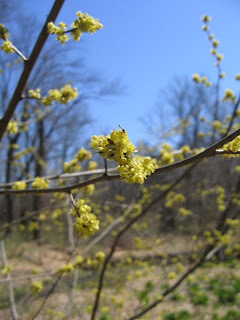 While the exotic but non-invasive forsythia blooms bright yellow in residential areas, the native spicebush is coloring the floodplains of natural areas with a subtler shade of yellow. 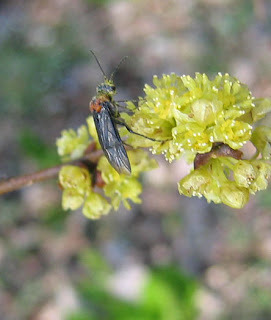 Pause long enough to take a close look at the spicebush shrubs and you're likely to find them abuzz with skittish flies of various sizes. The smaller ones allowed me to photograph them, but I had no luck getting a focused photograph of any of the other kinds. These and other entries this year will focus in on how wildlife is served, or not, by the plant life in Princeton's preserves. Insects play a big role in making the solar energy captured by plants available to other wildlife such as birds. Though birds eat seeds and berries, they rely on insects for a critical part of their diet, particularly during spring breeding season. Many insects, however, have not developed appetites for the many invasive species that have been introduced to this continent over the last several hundred years. These exotic plants, then, as they displace native species, may be depriving wildlife of the edible plants they need to survive. It's a compelling argument, and it will be interesting this spring to see how it plays out in the fields, and forests, of Princeton. 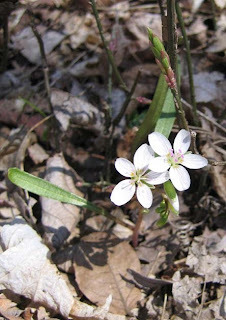 The spring ephemerals are in bloom at Mountain Lakes Preserve. Their survival strategy is to emerge early, bloom, set seed and absorb solar energy for the next year. By the time the trees sprout leaves and cast a deep shade on the forest floor, these wildflowers are finishing up and getting ready to go dormant until the next spring. The most common of these at Mountain Lakes is the spring beauty, which grows so abundantly along the driveway as to seem almost weedy. 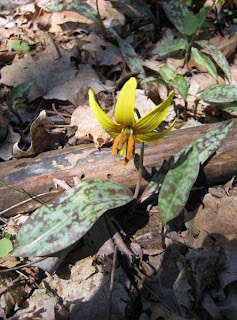 Less common, surviving mostly in floodplains, is the beautiful trout lily. Less common still (I've found a grand total of five of these in the whole preserve) are bloodroot, which actually keep their leaves into the summer. 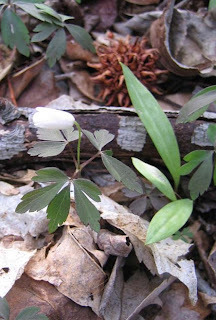 Other spring ephemerals that you will be lucky to find in a few locations are windflower and toothwort. The rarity of these wildflowers at Mountain Lakes is a legacy of the agricultural era, particularly the plow, which erased the soil's memory of past glories. Though the old fields eventually grew up in native trees, the spring flora don't have the capacity to quickly recolonize. 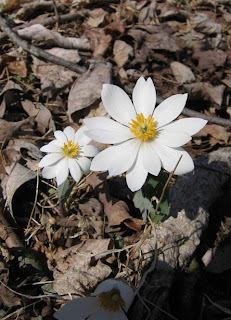 Browsing by deer has also played a role in suppressing wildflowers in Princeton's preserves, though the township's deer culling program is helping native species like the bloodroot to recover. The sidewalks and pavement of Princeton tell a lot about what sorts of trees are growing overhead. 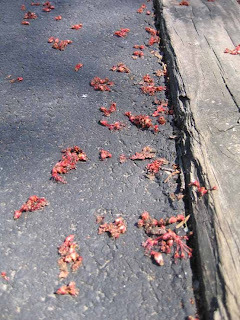 If you see lots of red when you look down, there's probably a native red maple above that has just dropped its small flowers. 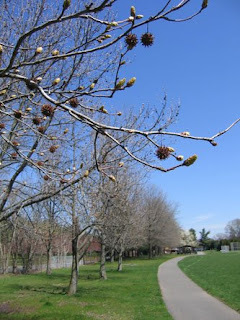 Even when past the flowering stage, the trees still have a reddish tint this time of year, as the seeds (called achenes) begin to grow out of the red flower stems that remain on the tree. 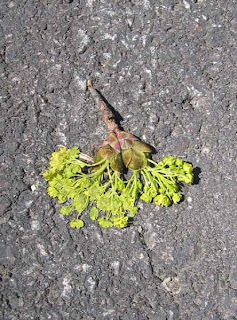 A spent flower cluster colored pea green indicates a Norway maple. This time of year, it's possible to travel down the street identifying every Norway maple in sight, with their distinctive shade of green. 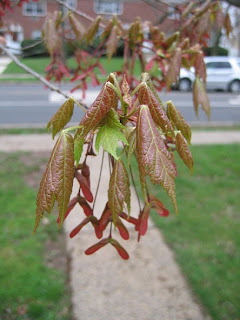 Norway maples were a popular exotic tree to grow at one time, but their very deep shade and allelopathic tendencies (they release chemicals from their roots that suppress growth of other plants) make it hard to grow anything underneath them. They have also proved very invasive in some parts of the country. 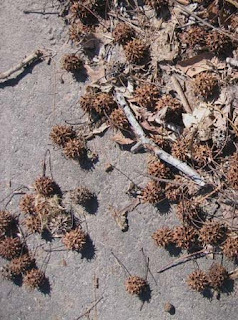 A collection of prickly balls on the street mean a native sweet gum tree is nearby. These sweet gums line the 206 side of the Community Park soccer fields. It's not the best tree to grow in a yard if you like to romp barefoot in the grass, but they can be impressive in other ways. 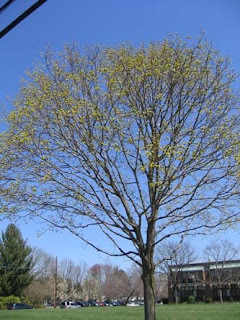 When I lived in Ann Arbor, Michigan, where they are uncommon, a horticulturist at the university took great pride in a small sweetgum he had planted. The beautiful paneling in my parents' home was said to be sweetgum. 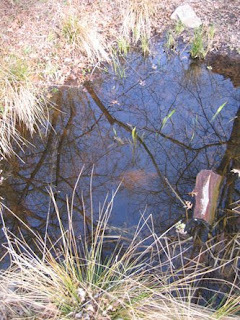 In natural areas, they tend to grow in floodplains, sprouting thickly in open areas.